Virtual learning, social media, and interprofessional collaboration are affecting all aspects of social services. Field education is responding with innovative programs and projects reflecting these real-world influences. The signature pedagogy of social work education is always evolving. Field education, where it is often said the rubber meets the road, has seen recent trends in its delivery, practice, and focus. With the increase in online educational programs, how students acquire, practice, and hone their interactive skills looks different than the traditional classroom setting. Another shift in preparing social work students to be professionals surrounds the increasing use of social media. Making sure students are aware of the new ethical standards and knowledgeable about the positive and negative aspects of social media use in the professional realm is important for field educators. Lastly, in recent years, social work has seen an increase in the interprofessional dynamic of social work with other disciplines. Being able to work effectively with colleagues from various professional backgrounds is crucial for social work practice. Ensuring students have mastered beginning social work skills and competencies prior to and during their field education continues to be a primary focus of social work education. This mastery is evaluated through different methods during the course of a student’s academic career. From critical thinking through papers and presentations to role play and simulations to the field practicum experience, students are provided multiple arenas in which to be evaluated on their skills and to learn from and integrate feedback. While role plays and the use of standardized clients have traditionally occurred in live, face-to-face classroom settings, the number of students requesting and attending distance learning or online programs is increasing dramatically. In addition to learning skills virtually, field programs are also grappling with the notion of virtual field placements. With video calls, telehealth, and virtual meeting mediums becoming commonplace communication and meeting forums, this provides a platform for discussing the educational soundness of virtual placements for social work interns. While virtual placements may lack the face-to-face interaction inherent in most practicum sites, they can also open the door for more specialized training. Students who do not live in a geographic area for a particular project or movement could still be provided day-to-day educational experiences towards their area of interest. Virtual placements may also allow for flexibility in scheduling a workday, as tasks that do not rely on other team members could be done during nontraditional work hours. Focusing on the learning contract, discerning opportunities for face-to-face engagement and ensuring students are gaining experience to be evaluated on each competency would be a collaborative effort between students, their field education office, and the agency. According to Madison Hale, MSW, from Troy University, “Completing an online/hybrid field placement with the Alliance of Social Workers in Sports was a beneficial placement, as it encompassed parts of the organization I had not realized were involved in daily operations. I observed the business aspect of social work, as well as the developmental and outreach side. It also allowed me to continue my work and schooling at the same time; this was extremely important and instrumental in my completion of my Master of Social Work degree.” As field agencies struggle with maintaining traditional placement sites as discussed during the 2014 Council on Social Work Education (CSWE) Field Summit, exploring the feasibility of virtual placements may be one way to help students capture innovative learning experiences (CSWE, 2014). Social work students now have opportunities to complete field placement in agencies that use technology to assist clients. UA has a field placement at Pack Health, which offers digital health coaching programs for 20-plus chronic conditions. Clients are assigned a health advisor to help them set and stick to weekly goals through calls, texts, and e-mails, based on communication preference. The director of health advising at Pack Health, Michael McMorris, MSW, discusses the positive impacts of telehealth. “Telehealth helps organizations and practitioners with efficiency, scalability, and connectivity with their clients. It is an efficient way to engage clients since there is no travel time involved for the client or the social worker. Due to this, it can be a way to scale a program for a single social worker to engage more clients with a greater reach into geographical areas than ever before,” McMorris says. With this change of dynamic, social work students have the opportunity to see appropriate use of technology-assisted social work services modeled for them and begin gaining mastery of this emerging trend of service delivery. It is also important to note that the NASW Code of Ethics (2017a) considers social media as tools that can be used to provide services to client systems. This is referred to as “technology-assisted social work services,” and it is defined as any service that is provided through the use of “computers, mobile or landline telephones, tablets, video technology, or other electronic or digital technologies; this includes the use of various electronic or digital platforms, such as the internet, online social media, chat rooms, text messaging, e-mail, and emerging digital applications” (NASW, 2017a, para. 10). With technology such an increasing focus in the field of social work, social work educators must be aware of the ethical standards and best practice guidelines related to technology. The most recent update to the Code of Ethics addresses these challenges by applying ethical standards to all interactions with client systems, whether they occur in person or with the use of technology (NASW, 2017a). Because the Code of Ethics considers social media as tools that can be used to provide services to client systems (NASW, 2017a), the NASW’s Standards for Technology in Social Work Practice provides a uniform set of technology standards for professional social workers to use as a guide in their practice (NASW, 2017b). Social work educators must understand the implications of these standards and guidelines in order to address technology and social media with students. Taking this understanding into account, it may be beneficial for field programs to create or modify their own field policies related specifically to student professional and ethical use of technology in placement. She further discusses the development of the Social Media Toolkit for Social Work Field Educators, a resource that provides educators and agency-level staff with concrete, research-informed tools to help inform students and staff how to navigate the ethical dilemmas commonly associated with social media use in professional environments. More than 500 copies of the toolkit have been distributed to social work educators, allowing programs to implement a social media assignment in field seminar utilizing activities from the toolkit (Hitchcock, Curington, & Carroll, 2018). In this first part of the assignment, students assess their own social media use as well as use by professional social work influences. They measure key metrics such as followers and number of posts and observe images and written content. In the second part, students use what they learned from the assessment to construct their own professional social media policy. Commonly included in the policy are topics such as confidentiality, boundaries with social media accounts, and communication preferences. This policy is then shared with the agency field instructor. Hitchcock says that field education offers a unique opportunity for students to develop and practice implementing their own social media policy while also sharing this new best practice with their field supervisor and agencies. While social work programs are educating students on appropriate use of technology and social media in practice, field instructors must also keep up to date on current ethical standards, best practice guidelines, and emerging policies and how they impact students. One way to keep field constituents updated on best practices and new policies is through field instructor trainings. Many schools provide continuing education through trainings, and information gained can help field instructors reflect on technology use in their own practice. Field instructors can also learn how social work programs are teaching students to use social media consciously, ethically, and with purpose, while also providing an opportunity for reflection on their own use of social media. Focusing on technology can also invite discussion surrounding boundary concerns, including student use of social media to connect with their field supervisor, clients, and other agency staff. This training provides field instructors and agencies the opportunity to further understand what is expected of students while in placement. Knowing the critical importance of being able to work with others in their role as a social worker, social work programs strive to provide unique, innovative interprofessional learning opportunities for their students. Interprofessional education (IPE) is defined as having students from two or more professions who are able to learn about and from each other and create effective collaboration in order to improve client systems (Interprofessional Education Collaborative, 2016). The CSWE emphasizes the importance of interprofessional work in the 2015 Educational Policy and Accreditation Standards, focusing on understanding and valuing the role of other professions with clients and constituents and using interprofessional collaboration to achieve outcomes with these groups. (CSWE, 2015). Field programs have unique opportunities to provide IPE to students through the use of simulation, interprofessional field placements, and partnerships within a college or university system. Field programs are also recruiting agencies and organizations to provide students with the experience and training to work with other disciplines. This can involve seeking out placements where social workers are currently practicing as members of interdisciplinary teams and also organizations that serve vulnerable populations but do not employ social workers. With today’s focus on integrated care, social workers in health care often work on interdisciplinary teams in order to provide optimal service to client systems facing an array of problems. More field programs are placing students in health care settings without social workers and providing MSW supervision through the school. For example, according to de Saxe Zerden, Kanfer, Palmer, Jones, and Brigham, two social work programs in North Carolina developed a program in 2007 that provides interdisciplinary field placement opportunities for MSW and BSW programs, called the Congregational Social Work Education Initiative. Students are paired with trained registered nurses who assess and treat medical concerns while the social work students assess and intervene in social and behavioral areas. Field instruction is provided by a full-time MSW level university faculty member (de Saxe Zerden, Kanfer, Palmer, Jones, & Brigham, 2018). There are other interprofessional field placement opportunities outside of health care. Social work field programs utilize placements in the legal system, including courts as well as the district attorney offices and public defender offices, to provide students with the opportunity to work with attorneys, judges, and probation officers. These offices often employ social workers and provide field opportunities for BSW and MSW students. Practicum students placed in these settings have the opportunity to work alongside attorneys, visit clients in jail, facilitate group sessions, advocate for clients, and participate in court hearings. A recent nontraditional pairing of professions with social work involves the fire department. Cacciatore and colleagues describe utilizing social work field students in their crisis response teams to assess, intervene, refer, and follow up as needed (Cacciatore, Carlson, Michaelis, Klimek, & Steffan, 2011). UA and UAB also offer an experience with fire and rescue services focused on reducing nonemergent transportation to emergency departments through education, case management, and advocacy. Social work students work on a team with other allied health professional students and members of fire and rescue squads. Through these innovative, nontraditional placements, the agencies benefit through a broadened scope of services provided and the students benefit from an innovative learning opportunity. Field programs have several factors to consider when recruiting interprofessional field placements. One item to consider is developing an organized approach to recruit these agencies, including establishing what opportunities social work programs want students to have and seeking agencies that can provide them. This may involve the discussion of additional eligibility criteria for agencies with social workers and developing new criteria for agencies without social workers. Another consideration is choosing a model for off-site or faculty-led field instruction when the agency does not employ social workers. This may consist of educating agencies on social work competencies and what services social workers are trained to provide. Field education is a dynamic, comprehensive learning experience inherent in social work education. Being able to adapt to innovative shifts and technological advances offers varied learning opportunities for all students, whether they live on a college campus or across the nation. These shifts and technological advances provide students opportunities to learn and practice social work skills in a variety of environments. Social work programs, particularly field education departments, can use their platform to provide exposure and educational opportunities to students as well as other field constituents on innovative practices, ethical standard updates, and other emerging social work practice trends. — Kimberly Gibson, MSW, LGSW, is field coordinator in the department of social work at University of Alabama at Birmingham. — Mary Jacque Carroll, MSW, LICSW, is director of field education and an assistant professor of field education in the department of social work at University of Alabama at Birmingham. Cacciatore, J., Carlson, B., Michaelis, E., Klimek, B., & Steffan, S. (2011). Crisis intervention by social workers in fire departments: An innovative role for social workers. Social Work, 56(1), 81-88. Council on Social Work Education. (2014). Report of the Summit on Field Education 2014. Retrieved from https://www.cswe.org/Centers-Initiatives/Initiatives/Summit-on-Field-Education-2014. Council on Social Work Education. (2015). 2015 educational policy and accreditation standards for baccalaureate and master’s social work programs. Alexandria, VA: Council on Social Work Education. Retrieved from http://www.cswe.org/File.aspx?id=81660. de Saxe Zerden, L., Kanfer, M., Palmer, M. T., Jones, A., & Brigham, R. (2018, October). Recruiting, maintaining, and sustaining integrated behavioral health sites for field education. The Field Educator, 8.2. Retrieved from http://www2.simmons.edu/ssw/fe/i/18-185.pdf. Hitchcock, L., Curington, A., & Carroll, M. J. (2018, November 1). Educator’s Guide - Social Media Toolkit for Social Work Field Educators, Second Edition (2018). figshare. Retrieved from https://doi.org/10.6084/m9.figshare.7287053.v1. Interprofessional Education Collaborative. (2016). Core competencies for interprofessional collaborative practice: 2016 update. Washington, DC: Interprofessional Education Collaborative. Retrieved from https://www.ipecollaborative.org/resources.html. National Association of Social Workers. (2017a). Code of ethics of the National Association of Social Workers. Retrieved from https://www.socialworkers.org/About/Ethics/Code-of-Ethics/Code-of-Ethics-English. National Association of Social Workers. (2017b). 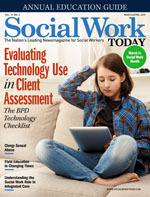 NASW, ABSW, CSWE & CSWA Standards for Technology in Social Work Practice. Retrieved from http://www.socialworkers.org/LinkClick.aspx?fileticket=lcTcdsHUcng%3d&portalid=0.